I confess to you that I'm not actually the type to purchase sticker books for my kids (up until recently, that is). I did buy one for use on an upcoming road trip. Road trips situations in which I think books like these come in handy! 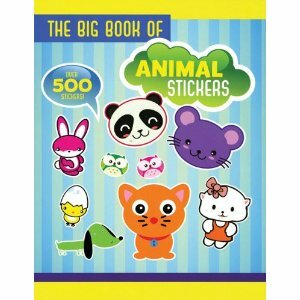 I was sent a copy of The Big Book of Animal Stickers for review purposes and I'm storing it away until it is time for said car ride. (Knowing children in backseats, I purchased one additional sticker book beyond this one to preserve the peace.) Being that this particular one features one of our favorite subject matters - animals - I think it will be popular and will give the boys something different to do in the car. There looks to be plenty of fun to be had with this book and I present it to you for your consideration. In order to be entered into this contest, please leave a comment below including a valid e-mail address. This contest is open to U.S. residents only and will be open through Tuesday, June 5th. Thank you, Silver Dolphin, for sending a copy of this book my way, as well as offering another to one of my readers. M LOVES stickers. Must be a 3 year old thing. :) You just reminded me to stock up on some for our upcoming road trips. Fun! Both of the older kids love stickers. Nice offer. Thanks for the chance to win. I love sticker books and my kids love sticker books! I discovered the beauty of sticker books the first time I flew from Virginia to Nevada alone with the two boys....have I mentioned that I LOVE sticker books? This book would have a happy home here! Grasshopper loves his animals AND stickers, so I may have to get him one of these either way. We're always looking for new things to make it through church services halfway quietly! With multiple trips happening this summer...I'm in! This would be perfect for my nephew and niece! My daughters are really into sticker books right now. We'd love to win! I saw the post on FB, too.